If you’re looking to correct skin problems without the pain and discomfort of an invasive surgical procedure, you’ve come to the right place. Dr. Bawa & Associates is an established medical spa in Destin, FL offering hydrafacial treatment to patients wishing to improve their appearances. At Dr. Bawa & Associates, our goal is to produce the aesthetic results you’re after. When you visit our Destin, FL facility for treatment, you’ll be welcomed by a friendly staff and a calm, soothing medical spa environment. We understand that most people would prefer to avoid the discomfort and downtime associated with surgery. That’s why we strive to offer treatment options that are effective but far less invasive. This treatment is an incredible innovation in skincare that hydrates, exfoliates, extracts, detoxifies, and cleanses all in one, regardless of skin type. Hyperpigmentation, wrinkles, fine lines, and pore size can all be reduced through the use of this treatment, as well as dark puffy eyes. 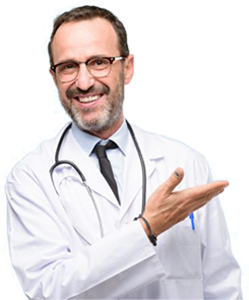 The whole process involves the use of a special handheld device that has multiple tips depending on the application and administers a variety of solutions dependent on the goal of the treatment. There are two different versions of the Hydrafacial treatment available at most clinics, one taking 25 minutes and another that takes 80 minutes that is used for treating severe cases. It accomplishes all of the above without any downtime or irritation to the skin. What makes a Hydrafacial good for my skin? One of the foundations of glowing, healthy skin is good hydration. Many treatments that are used to help reverse the signs of aging are harsh and irritating to the skin, and irritation has been shown to be one of the leading causes of increased signs of aging. 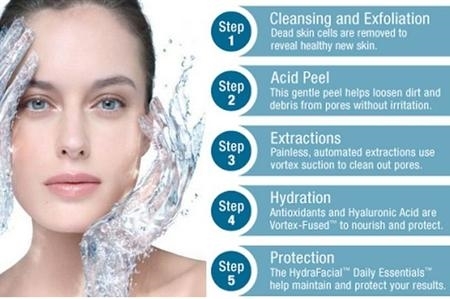 With a hydrafacial you’re receiving a non-irritating and hydrating treatment that makes your skin look great. How long a hydrafacial takes is dependent on the severity of the condition being treated and the area being treated. A basic treatment can take as little as 25 minutes while a longer, more intensive, treatment can take up to 80 minutes. However there is no recovery time from a hydrafacial so you can put on make-up and go back to your day without interruption after the treatment. What kind of results can I expect to see from a Hydrafacial? It is common for patients to report that their skin takes on a more even, radiant tone following a single hydrafacial treatment. These results are reported to last a week or longer, and most patients receive repeated treatments on a monthly basis to help improve oily, and congested skin, brown spots, fine lines, and wrinkles. The best results come from an ongoing regiment of treatment. Is there any pain associated with a hydrafacial treatment? The hydrafacial treatment is completely painless. How many treatments will I require to see noticeable results? To tackle the most common client complaints, wrinkles, fine lines, hyperpigmentation, etc, the most common course of treatment is six sessions. Following these initial treatments most patients elect to continue receiving treatments once or twice a month.